Two years ago a spy adventure hit our screens with more than a bang but a brutal, bloody, foul-mouthed explosion. The whole thing was a pleasant surprise with action that James Bond and Jason Bourne would run away from. I remember sitting in a cinema in Watford, literally forced into my seat during that infamous church sequence. The film was deservedly a huge hit so it was almost certain to spawn a sequel. Now we have Kingsman: The Golden Circle, which does what every other sequel does: bigger, longer, louder. 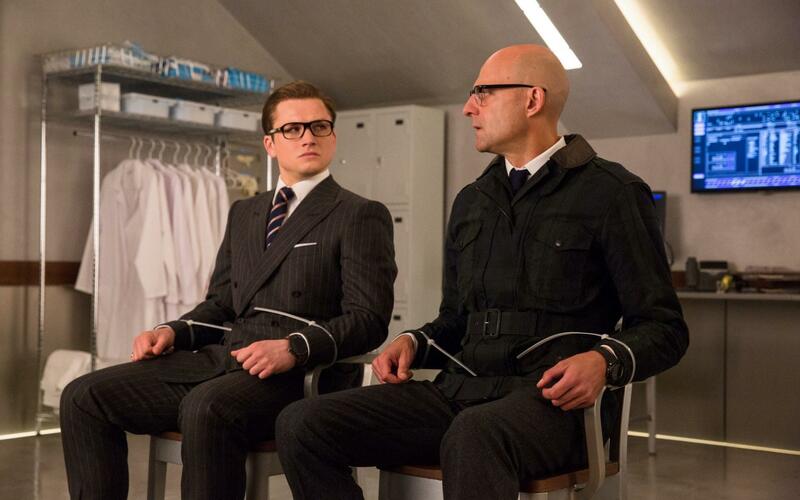 The Kingsman has come under attack by Poppy, a drug dealer who plans to hold the world to ransom. 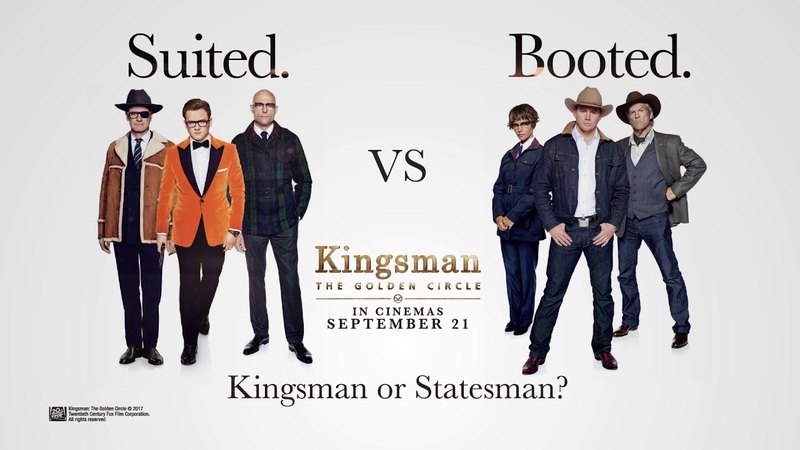 With only Eggsy, now a fully fledged Kingsman, and Merlin alive, they discover Statesman, the American equivalent to their own organisation. The President plans to use Poppy’s plan to eradicate drug users, it’s up to Eggsy and the Statesman to find Poppy and stop her. They are going to need some help in the form of a face from the past who Eggsy thought was dead. Matthew Vaughn’s original was a fun-packed thrill ride that worked on so many levels, none more so than its extreme visceral set pieces. Knowing a good thing when he sees it, he has taken those elements once more and filled the film with the sort of action set pieces that other films of this type would only dream of copying. The idea of a street-wise kid becoming a gentleman spy was also part of the joy of the first film, allowing it to be a swearing, modern affair while still capturing a feeling of the old 60’s spy adventures. This longer sequel suffers the same fate as Guardians of the Galaxy Vol 2 fell. The element of surprise. The Secret Service came at us out of the blue. No one knew what to expect and so it was an enormous surprise. This time around, we do know what to expect and so Vaughn has to work hard to deliver. Sadly, he falls short but only just. Instead of upping the ante and maybe going down a different route, he gives us something a little more comforting but 20 minutes longer. This is one of its downfalls. Those 20 minutes are very noticeable and if the film had been tighter, it would have been just as enjoyable. The set pieces don’t have the same level of punch. When watching Colin Firth taking down the thugs in the pub or that massively impressive church scene, we were blown away. Unfortunately, nothing reaches those heights this time. The set pieces are still impressive and entertaining, including a repeat of the pub fight and an opening that will have you rubbing your hands with glee with a feeling that this is going to be another rollercoaster ride. They cannot better what Vaughn delivered previously. The plot this time also feels slightly ordinary. Last time, Samuel L. Jackson’s crazed computer whiz had a totally nutty plan that fits neatly with the rest of the film. This time, we have a homely villainess who plans to hold the world to ransom after poisoning the drug takers, which, without an antidote, will kill them. It needed to be more off the wall than that. It felt too much like other plots from this kind of movie. Having said that, this is still a wild and often bonkers ride with flashes of pure genius. The cast, now brimming with star names, all seem to be having a blast and bringing enough energy to keep things moving. Taron Egerton has stepped into the shoes of leading man with great ease and it’s always a pleasure to see Mark Strong, this time with a strange musical tribute to John Denver. The new additions work nicely too. 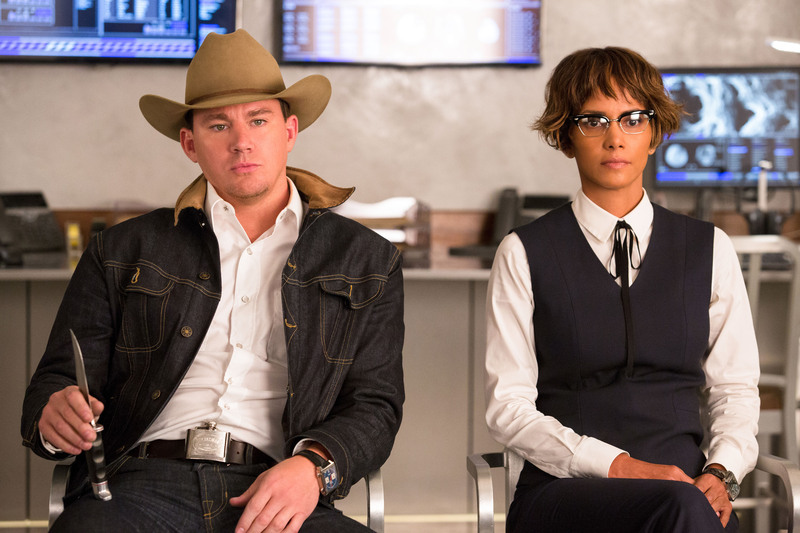 Halle Berry, as Statesman’s equivalent to Mark Strong’s Merlin, brings a sassy air of cool to a nerdy character, while Pedro Pascal compliments Egerton’s foul-mouthed Eggsy with a smooth Texan who can really work a lasso. Jeff Bridges, looking more like his dad, Lloyd, every day, gives us a performance that wouldn’t look out of place in Dallas, while Channing Tatum seems a little wasted in a bit part as another Stateman agent. Where the film scores huge points in using Julianne Moore as the villainess, Poppy. This is not your average baddie. Instead of heading down the pantomime villain, Moore gives us as more homely, all-American girl baddie who comes across all sweetness and light. It’s a gamble that works magnificently. Without giving too much away, although he does head the bill, Colin Firth is back and while he plays the English gent with ease, it’s great to see him back in that fighting state that made the first film such a joy. All of this is nothing compared to the star of the show…Elton John! He steals every scene he is in and gets the biggest laughs every time he opens his mouth. An inspired piece of casting. 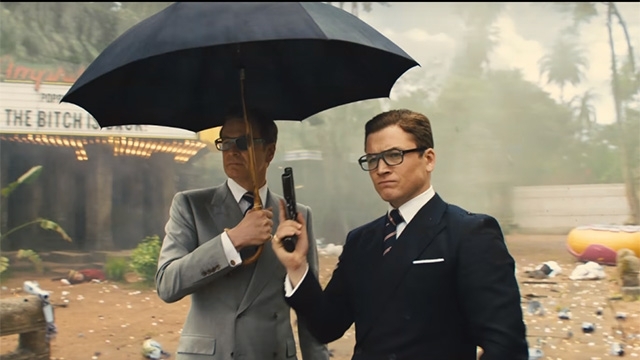 Kingsman: The Golden Circle isn’t a disappointing sequel by a long shot. If you want more of the same that you got from the last time, it gives you that. It just doesn’t have the edge this time and if they had kept it brisk and under two hours, it would have quite easily have been a five-star movie. It still spits in the eye of other action films around but maybe less would have been more.